Hugh Laurie as Dr. Gregory House in TV series House M.D. House M.D. 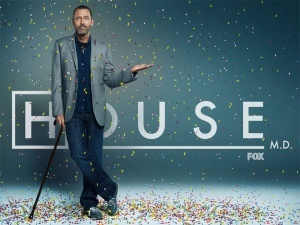 then House is an American TV series created by David Shore, produced by NBC and UMS, aired through 8 seasons and 176 episodes between 2004 and 2012 on Fox, starring Hugh Laurie as Dr. Gregory House. This medical show is about a misanthrope M.D. with unconventional methods which have some similarities with Sherlock Holmes ones such as observations and deductions. 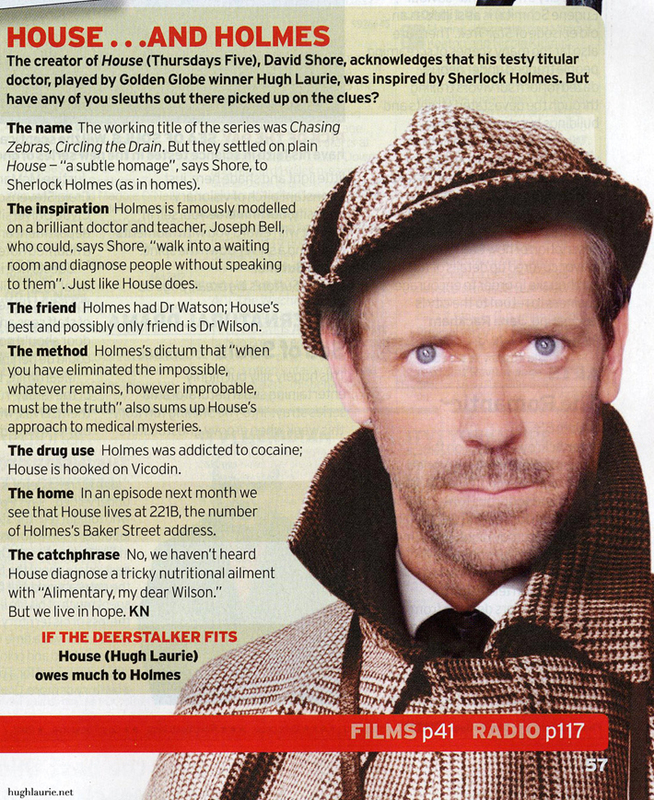 The character name House has been choosen because of the similar sounding than Holmes (i.e. Homes). House lives at 221 Baker Street, appartment B. House is a drug addict. But with Vicodin. His best friend is Dr. James Wilson. In episode It's a Wonderful Lie, House receives a Conan Doyle book as a Christmas gift. In episode The Itch, the book The Memoirs of Sherlock Holmes can be found in his appartment. In episode Joy to the World, House uses a book from Dr. Joseph Bell (the professor of Edinburgh University which has inpired Conan Doyle for creating Sherlock Holmes). The book was offered by Wilson with the message: « Greg, it recalls me you. » The book belonged to an former patient called Irene Adler. This page was last edited on 23 March 2019, at 23:51.